Get ready to travel around the world in a new Mickey Mouse Clubhouse adventure. In the Around The Clubhouse World, children visit the Eiffel Tower in France and say “bonjour” to Mademoiselle Daisy and Monsieur Donald Duck. Then, rescue Gondolier Goofy when he goes adrift in Italy’s Grand Canal; solve the mysterious riddle of Pharaoh Pete’s pyramid in Egypt, and meet a dancing dragon at the Great Wall of China. With help – and the right Mouseketools the Clubhouse friends can get their special passport stamped at each wonderful location. I am a big history and art history buff, so I’ve always had a natural curiosity about different places. I feel the better one understands the world the more accepting they will be of others. Therefore, teaching my daughter, Ava, about the different countries and cultures of world is very important to me. This special episode introduces popular countries – France, Italy, Egypt and China to children in a fun, yet educational way. In each country the clubhouse friends focus on a historical landmark while learning about something culturally important – food, tradition, language etc. A sticker passport that children can fill out during the episode comes along with the DVD. I particularly enjoyed the Italy segment in which Goofy sails past the famous Rialto on the Grand Canal. Italy is very close to my heart. My husband and I have traveled throughout the country and brought Ava with us on her first birthday. The fun doesn’t stop after the Around The Clubhouse World episode. The DVD comes with four additional episodes – Donald And The Beanstalk, Goofy On Mars, Mickey’s Handy Helpers, and Pluto’s Dinosaur Romp. 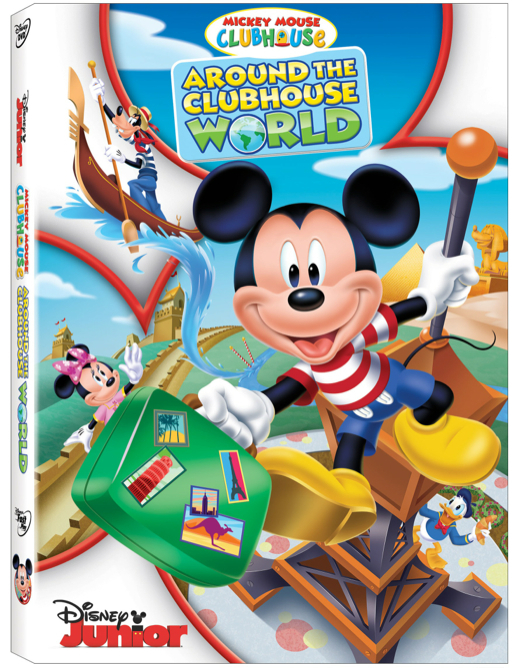 Mickey Mouse Clubhouse: Around The World can be purchased starting May 20th at your local retailer and on Amazon .